He’s talking about the recent resignation of US Attorney General Jeff Sessions. According to Pew Research, 62% of Americans believe cannabis should be legal. Medical cannabis is already legal in 33 states. Clearly, the US electorate is pro cannabis legalization. And having Sessions as acting attorney general was a major source of uncertainty for US cannabis companies. 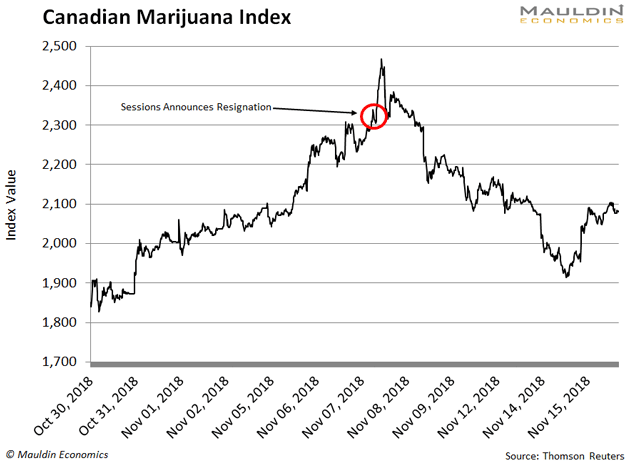 As you might expect, the cannabis market cheered his resignation. With Sessions gone, it won’t be long before we hear talk of legalization in the US. Canada beat the US to the punch, enacting full legalization last month. But there’s another way. I found a low-risk backdoor into the cannabis market. 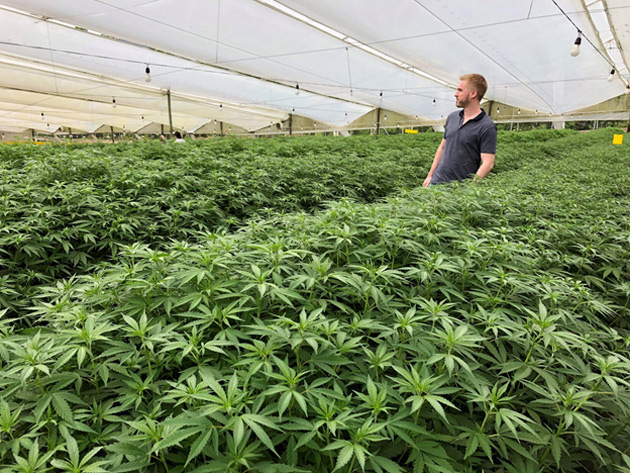 There are well-known, big-brand companies that have partnered with smaller cannabis companies that specialize in cannabidiol, or CBD. But the safest opportunity is in companies that focus on non-psychoactive CBD. CBD is derived from the cannabis plant. He told me how you can extract THC or CBD from the marijuana flower and make oils, edibles, tinctures, creams, and—of course—smokable marijuana. But THC has only one use: getting high. On the other hand, CBD has many uses. One that’s often overlooked is enhancing mental focus and reducing inflammation. In fact, he noted the World Anti-Doping Agency recently removed CBD from its banned substance list. They did this because it truly helps athletes recover faster. We talked about the many uses for CBD. One that stood out to both of us was the beverage market. You could make a CBD-infused beer, or a CBD athletic drink. Think of it as the marriage of 5-Hour Energy and Gatorade. And major beverage companies are doing just that. But the most surprising company on this list is Coca-Cola Co. (KO). The iconic American company has been in talks with Aurora Cannabis to create a CBD-infused beverage. Coca-Cola executives claim they are tapping into the surging market as its traditional sales slow. They also note how CBD-infused drinks could ease inflammation, pain, and cramping. So if you want a low-risk backdoor into the legal cannabis market, the beverages industry is the clear avenue for you. Nov. 21, 2018, 4:57 p.m.
It’s not quite true that THC has only one use: getting high. There are some illnesses like epilepsy and multiple sclerosis and possibly Tourette’s syndrome for which it has a mitigating effect. Pleas read and consider these issues before you recommend your readers provide funding to this industry. Also, CBD does not treat seizures in adults. I know: I have a seizure disorder and tried medical grade CBD that gave me poor balance but did nothing for my temporal lobr seizures.